A mannequin head sits outside a trailer on the Sony lot, propped up on a stick and with a curly, black wig atop it, a crewmember carefully blotting the wig with a towel in the warm afternoon heat. This is Nick Fury's wig, and it's how the iconically bald Samuel L. Jackson is transforming into his Marvel alter-ego some 20 years in the past in Captain Marvel. That, plus a series of dots mapped across the actor's face, is used to pull off an uncanny de-aging and bring Fury to life decades before he would begin recruiting Avengers in 2008's Iron Man. A group of reporters has gathered with a bewigged, eyepatch-less Jackson on the set to discuss what this iteration of Nick Fury is like. "You trying to get me fired?" he deadpans incredulously. This being Jackson's ninth appearance in Marvel's cinematic universe, he knows better than anyone what lengths the studio goes to in order to protect its secrets. (And it's ironic, then, that soon after he's the one who drops a potentially massive clue for Avengers: Endgame.) "What am I allowed to say?" he asks a nearby publicist, who reassures Jackson that he is allowed to share Fury's basic backstory. "Really?! S**t," he says, though he thoughtfully parses out his words, nonetheless. "I've been riding a desk at..." S.H.I.E.L.D.? "So, you don't need me," Jackson chuckles. "I've been riding a desk at S.H.I.E.L.D. and trying to figure out where the next threat will be coming from, dealing with NSA and all these other people, never thinking that there were extra terrestrials. This is the first time that I encountered them and form a belief that those people are out there, and that there are people who have extraordinary abilities that can help us combat them." Personality-wise, how is Fury in the '90s different than the Fury we know from Iron Man on? Probably not as cynical just yet. Things are changing. The world is changing for him, how he views it in terms of who we are in respect to the rest of the galaxy and there [being] a much greater thing out there than who we are and what we are -- and that they pose a greater threat than anyone even knows and we literally have no defenses against them. 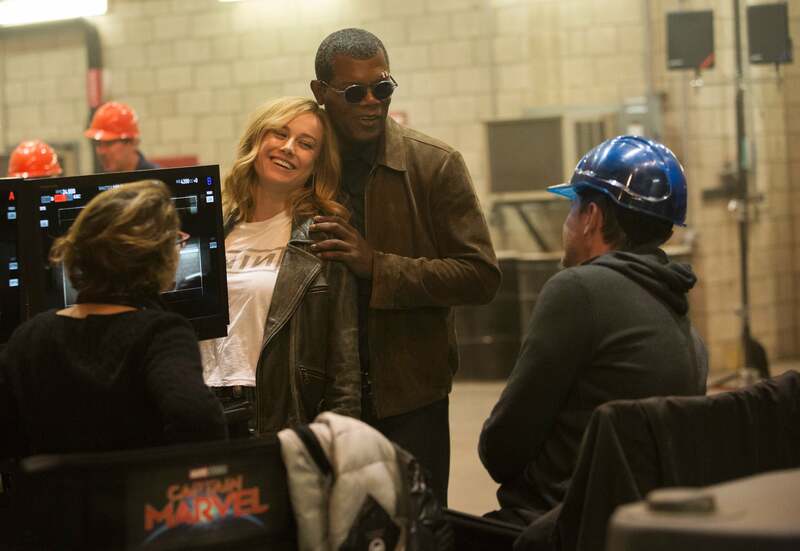 [Producer] Jonathan Schwartz said that this movie is a two-hander that features Nick Fury prominently. What do we learn about Fury that we haven't over the course of this last decade of him popping in and out of movies? You'll see, specifically, the origin of what happened to his eye. You'll find out that he does have a family, that's referenced. You don't see them, but they are referenced in another way. There are things we talk about in his backstory that haven't been talked about before -- where he's from, what he's done. There are times when he actually, humanly reacts to things with fear and awe, instead of the stone face that he normally has, before he learns to control his emotions in another way. We don't talk about none of his war experiences. We talk about him being in the war, leaving the war, being a spy and some of the things he did when he was a spy that got him to this particular place. So, we get more of a backstory, and we get more of what turns him into this person that you originally meet in Iron Man. Did you know all of that, about his backstory, before you started filming? Or was this movie a discovery for you, too, in terms of this character? There are specific things that are documented about his backstory, back when he was a white guy fighting in the war. [Laughs] I've been reading Nick Fury since I was a kid, so there are a lot of things that I know about him and about his origin story and the people that he fought with and who he knew before all that happened. And then by the time we got to the Ultimates Nick Fury, all of a sudden [he] turns into me, out of nowhere, because of [comic book writer] Mark Millar, and we start a whole new kind of backstory timeline. What was one specific fact that you learned about him on this film? That everybody calls him Fury, even his mother. Can you tell us more about the scene you're filming? They told us you're on a Kree ship. Well, that's what they wanted you to know! You're trying to get me fired again. He's dealing with the Flerken for the first time, and it looks like this is his first time seeing the Tesseract. He who? He me? I've heard the cat referred to as a Flerken. I didn't know what that meant, so I vaguely have an idea now what that means. And we're actually entering a ship that belonged to a doctor from Carol Danvers' past. She's trying to find some answers to what happened, why he was on Earth and what that whole power core thing-- Seems like the Tesseract has been the constant in all these movies. What is Fury and Carol's dynamic like when they first cross paths with each other? Well, when they first cross paths, she's just a crazy lady that broke into Blockbuster. She's standing there telling me that she came from some planet and she's got on strange clothes and she's saying there are these shape-shifting people that have infiltrated Earth. And we're kind of looking at her like a normal person would look at a person who tells you something like that. You kind of go, Yeah, right. Then she runs away and later on, I discover, OK! She might have been telling the truth. So, that changes that dynamic for the next time we see each other. Clark Gregg is also back as Phil Coulson. Is your relationship dynamic new here? He's brand new. He's just joined S.H.I.E.L.D., so he's a rookie and I have to ask his name at a certain point. Who are you again? Yeah, he's brand new. What has it been like working with Brie? It's my third time with Brie. I did Kong with her and then she directed me in her own movie, Unicorn Store, and now we're here. We're very good friends. We work well together. We laugh together. We sing together. We developed a really, really great relationship when we were on Kong, traveling all over the world doing that thing and she was running back and forth to all her award shows being lauded. You know, it's fun to be in the saddle with her, and I think it's comforting for her to have someone around like me, that's actually been a part of this Marvel universe for a while, who understands the largeness and the expectations that are there, so that she doesn't feel pressure. I understand that there are some things that go with that -- you being a new character that's being introduced, wanting to be as dynamic as all those other characters you've seen. It's kind of crazy to go to something like Avengers and Black Panther before you start shooting, and you look at it and you go, Oh my god, what do I have to do? Part of my job being with her is to tell her, "Look, create this character that you want and make her as dynamic as you want her to be. And Marvel takes care of the rest." They're responsible for marketing and making it all those other things. But we got a good script, she's a good actress, I'm OK. [Laughs] You know, we got things going on. It's like we always said about Kong. We're there, yeah, but it's so much about those other things. This is Marvel’s first female-led superhero film. Why do you think Captain Marvel is the right character to headline her own movie? Having known Brie for a while now, what is it about her that you think makes her the perfect Captain Marvel? She has a lot of compassion, for one. She’s a very principled individual, as you can see from her IG. She champions all of the right causes. She's very aware of who she is and her place in the universe, in terms of what she is as a person of influence [being] an actress and her voice being used in the right way. She has the strength and determination that, for a person her age-- There are all the kinds of things she could have done aside from putting herself through six months of torture to get ready to do this role. If you see her workouts -- she sends me videos of her workouts -- she's working very hard. Her body is incredible now from all the stuff she's done. She's down to, like, five percent body fat, maybe. She's all muscle. She couldn't do push-ups when they started. She can do lots of push-ups now. She pushes Jeeps uphill as part of her training. She's totally dedicated to making this something, and the way she empowers women already, you know that she is going to give this character the qualities that will make any woman, young girl, anybody looking at this wish they could be her or feel like they could, because they have the ability.